Welcome to Big Sky, Montana where adventure can be found in every direction. One of the best ways to explore is to go hiking. There are hundreds of miles of hiking trails weaving their way through the mountains around Big Sky. 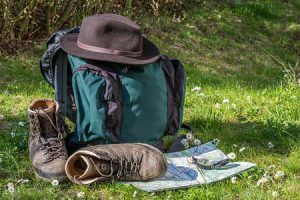 But before you head out seeking world class basins filled with wildflowers, stunning alpine lakes, and towering summits, make sure that you have these hiking essentials. Hiking requires a bit more than just grabbing your backpack and hiking poles, lacing up your trusty old hiking boots, and hitting the trail. The power of your own two feet can take you far off of the beaten path. Are you prepared for the Big Sky backcountry? Bear Spray - We share our backyard with both grizzly bears and black bears. You need to be bear aware. These creatures tend to avoid humans, but a chance encounter can be scary or even deadly. Bear spray acts like mace (not like bug spray) in case you have a bear encounter. Water - Humans need water to survive. Drink water regularly. The more you drink the better you will perform and the better you will feel. Carry a way to purify water from streams or lakes so you can refill in the backcountry. Snacks - Food replenishes our body with extra calories that we burn on the trail so that we can keep going. Extra Layers - In Montana, you never know when the weather might change. Thunderstorms are common in the afternoon and it seems to snow in Big Sky at least once a month. Bring extra layers - an insulating layer and a waterproof layer - even on the nicest day. Avoid cotton as it retains water and is slow to dry. Communication Device - There is plenty of debate about electronics in the backcountry, but carrying your cell phone is a good idea. Not only will it take great pictures, but in an emergency you can often find a cell signal and make a call. Download apps on your smartphone like GAIA or Topo Maps to help you stay on track. If you bring electronic devices, bring a charger/power pack too. Headlamp and Batteries - Bring a headlamp with extra batteries on every hike. It's no fun to get stuck in the woods in the dark without one. First Aid Kit - A first aid kit is essential to patch up blisters, gashes, bruises, and other ailments. Bring one with you that has things you know how to use. 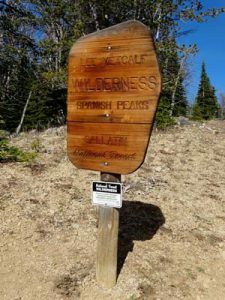 If you find yourself spending lots of time in the backcountry, take a wilderness first responder course. Sun Protection - This includes sunglasses, sunscreen, and a hat. When you're at high altitude in alpine environments the sun can scorch your skin. Prevent sunburn and protect yourself from the rays of the sun even on cloudy days. Navigation Tools - Bring a map and compass to help you orient yourself in case you get lost. These tech-free devices can help you find water, campsites, trails, and your car. Safety Tools & Repair Kit - Pack a small and compact repair kit that includes both safety tools (fire starter, whistle, and knife/multi-tool) and repair items (extra shoe laces, Gorilla Tape, backpack straps, a Voile Strap). These things can definitely save your day. Keep these hiking essentials in your pack at all times. You might not use them very often, but when you need them you'll be thrilled that you have them. Always pack what you need because it's not easy to run home when you're approaching Summit Lake or climbing Beehive Peak. Now go outside and enjoy the fresh air, soak in the silence, appreciate the views, and get a bit of exercise. You're ready for a day on the trails in Big Sky.